Straight bars, 17in wheels, upside down forks, fox-eye headlights and an 800cc inline triple - could this be a secret, pre-production Triumph Street Triple 800? We wish. In fact this isn't a big-bore version of the 675cc Street Triple - one of the finest roadsters you can buy - but it could be the next best thing: a Triumph Tiger 800 given the supermoto treatment by Triumph dealers, Jack Lilley. A few carefully chosen parts transform the character of the Tiger 800. The big difference is the wheels. Standard 17in rear and 19in front cast items are replaced with a pair of 17in Excel rims, with hubs from the off-road Tiger 800XC. Dual-purpose knobbly tyres have been replaced with sticky supersport Dunlop SportSmart road hoops. Street Triple headlamps and fly screen replace the Tiger's standard lights and tall screen while a Speed Triple 1050 bellypan sits under the engine. All the work, including modifying the fairing bracket and removing the lugs was carried out by Clive Wood, who used to run Jack Lilley's race team. 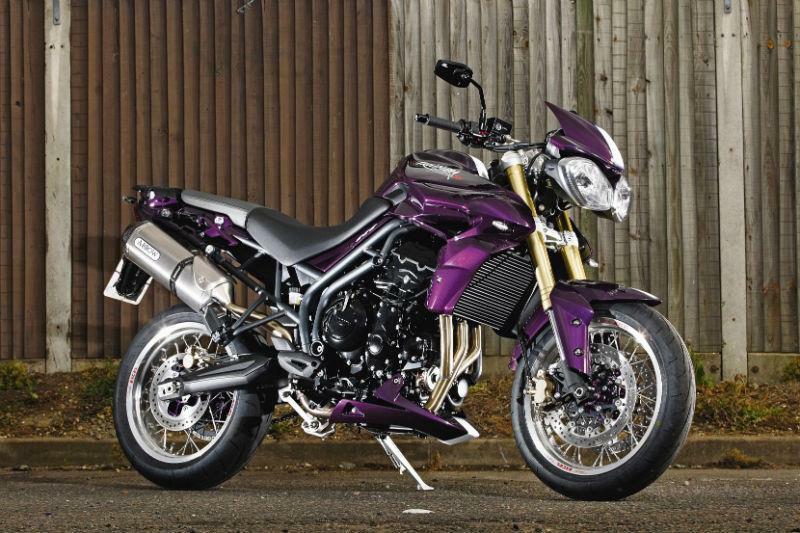 It also has an Arrow exhaust, LSL mirrors, Triumph adjustable racing clutch and brake levers and a complete respray by top painters Altamura in 'Imperial Purple' (an official 2011 Street Triple colour) with a white racing stripe. Aside from that, brakes, suspension, engine and the rest are all untouched. The standard Tiger 800 is £7299 and this one-off special costs £10,999, actually a lot less than the sum of its new parts, labour and paint. It may be 95% the same as a Tiger 800, but this supermoto special feels totally different - tough is the best word to describe it. The steering is now much sharper and more direct. It now changes direction with the kind of speed the standard bike could only dream of. The smaller front wheel makes the bike seem shorter, more controllable and actually makes much more sense if the only off-road you ever do is bump up a kerb on to your drive. 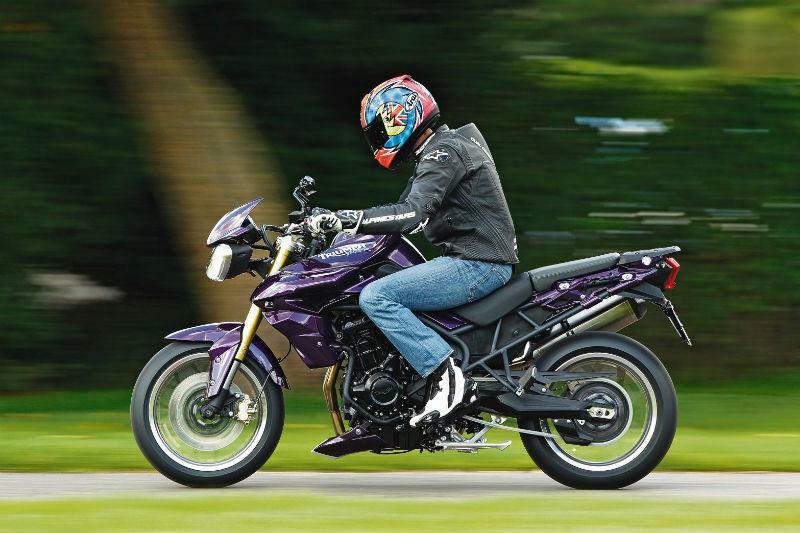 Read the full review in the current issue of MCN (28 September), on sale now. Don't miss out - subscribe to MCN from only £1 per issue.